I knew Brandon Beane would trade for a wide receiver this summer. I had no idea who it would be, or what deal he would deal with. But you knew a trade was coming. That’s what Beane has established in his tenure as Bills GM. He’s not afraid to make a deal, either to get rid of his trash or to bolster a weak position. 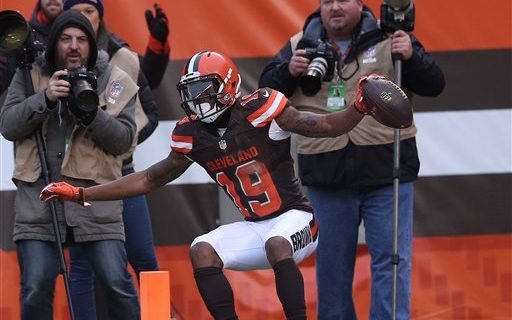 That’s what he did Sunday night, trading a reported late round draft pick to Cleveland for Corey Coleman. The former first round draft pick has talent. That’s clear when you look at his college stats and 4.37 40 yard dash time in college. Now, whether he’s durable and whether he’s a good football player are the questions that haven’t been answered. But why not take a chance on a high draft pick, who’s career has been plagued by injuries? There may be a legit question whether he can play or not. Cleveland wasn’t willing to wait, not after signing Jarvis Landry and relegating Coleman to #3 at best. For a Bills team that may be looking at starting Rod Streater, it’s a worthy gamble. Coleman immediately puts himself in the mix to start opposite Kelvin Benjamin. At worst, if Zay Jones bounces back, Coleman could be a #4 long ball threat. Would you rather have Coleman running deep routes or Streater, Andre Holmes or Robert Foster? This is another smart move by Beane. He surveyed other teams in relation to his weak sports, identified a team with an excess, and made an offer. This is how GM’s work now, with trades just another way to upgrade talent. Where else were the Bills going to upgrade the position this season? Next year, awash in salary cap space, will be when the team really gets a good player. But for now, it’s a worthy gamble to see if Coleman can be a better weapon for McCarron or Peterman, and eventually Allen. I love that Beane is aggresive. This is a good move for the Bills.